Veterinary receptionists greet clients, set appointments, and process payments. They're the first person a visitor encounters in the vet's office, and as such should be calm and reassuring. Their tone and demeanor can help a pet owner and a pet feel less stressed out about visiting the vet, which makes the experience easier for everyone. In addition to providing excellent customer service to clients and ensuring that front desk operations run smoothly, the receptionist acts as the primary greeter when a client enters the waiting room with their pet, alerts the appropriate technician or veterinarian to the client’s arrival, and processes the client’s payment at the conclusion of the appointment. The receptionist is also responsible for answering incoming phone calls, scheduling client appointments, updating and filing patient charts, entering data into computerized billing programs, retrieving prescriptions, and assisting with pet supply purchases (pet food, supplements, grooming items, over the counter treatments, or other items). They also must keep the waiting room neat and clean at all times. The veterinary receptionist must be comfortable working around a variety of animals and may be required to take animals back into the treatment area if all technicians are otherwise occupied. They also must be able to screen and schedule individuals attempting to contact the veterinarians, such as veterinary pharmaceutical sales representatives and other vendors. They have to able to communicate well with all members of the veterinary office staff including veterinarians, technicians, kennel attendants, and practice managers. Veterinary receptionists can expect to work some evening, weekend, and holiday hours depending on the schedule at their individual clinic. Veterinary receptionists may transition into a variety of other veterinary clinic roles such as office manager, kennel manager, or veterinary technician. They may also pursue receptionist positions outside of the veterinary environment. 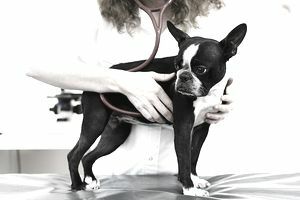 While a college degree is not necessary for this position, many veterinary receptionists have a degree in business or in an animal related field. A high school diploma or GED is generally sufficient to meet an employer’s educational requirements. A background working with animals, particularly in the veterinary environment, is a big plus. Excellent customer service skills are critical. It is also important that veterinary receptionists have solid computer skills. They generally go through significant practical training to become familiar with the veterinary practice management software used at their clinic. There are several popular software programs that allow the receptionist to update the patient file database, maintain the clinic’s appointment book, and provide invoices for billing purposes. Receptionists must also be able to process credit card payments and prepare bank deposits. Veterinary receptionists may achieve professional certification through the AAHA (American Animal Hospital Association). The Veterinary Receptionist Certificate course is offered in an online format and can be completed in three semesters. The salary that a veterinary receptionist earns is usually commensurate with their level of experience and education in the field. It may also be influenced by the prevailing average pay rate where the clinic is located. The Bureau of Labor Statistics salary survey projects a 14 percent increase in job opportunities for receptionists through 2022. This rate of growth is slightly higher than the average growth expected for all professions (11 percent). Job opportunities for veterinary receptionists tend to come up regularly in most areas. The veterinary profession has shown strong growth in recent years, driving the need for additional support personnel as veterinarians open their private practices. Turnover is also to be expected as experienced veterinary receptionists retire or move into other industries.